I attend a meditation group on Saturday mornings whenever I can, which is quite often actually. A few months ago someone in our group mentioned that the Dalai Lama was going to be in Fayetteville, AR and that we should all go. The Dalai Lama. In Fayetteville, Arkansas. I know. How weird is that? Seemed kind of odd to me that’s for sure. But there is a pretty good sized Tibetan community located there and they in fact, had been working on getting him to their town for quite some time. He was slated to give two talks on May 11. One in the morning and one in the afternoon. We all decided we would send in our loot for tickets to both sessions and make a day out of it. And make a day we did. We all received our tickets in the mail ahead of time so no will call window for us. We took a couple of cars to the event and left at the early hour of 6:30 in the morning the day of. The morning session was a panel of people which consisted of Sister Helen Prejean, Vincent Harding and his Holiness himself. I really enjoyed hearing the other two speakers talk, especially Helen Prejean. I think I would like to hear her speak again someday. The Dalai wore a red sun visor. Too many indoor lamps I guess and he sat cross legged in a big, red chair. He was very soft spoken and hard to understand that morning. The theme was non-violence and the world today. Something I think everyone can use a lecture on if you ask me. We took a break for lunch and we all had to leave the arena. Security sweep you know. Entering the place was like going through airport security. Only I didn’t have to take off my shoes. We nabbed much better seats for the afternoon session and the Dalai seemed a bit less tired. He had the cutest little translator that stood by his side. I think the guy could actually read his mind because if he couldn’t get a word out the translator knew it immediately. 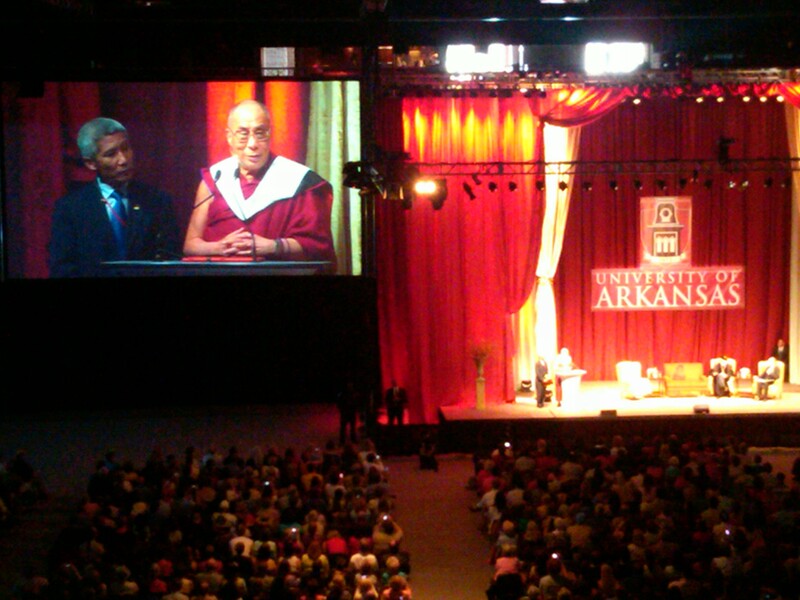 The Dalai was cloaked with a sash on receiving an honorary degree from the University of Fayetteville. He stood at the podium to give thanks and kept pulling on the v-neck part of the sash because it was constricting to him. He chuckled about it and I found his sense of humor humbling and humorous at the same time. After the thank you he sat down and the translator read several questions that people had for him. Some were very political questions and some were more personal. Things like did he ever learn to drive a car. The answer to this question was quite funny as he told a story about getting behind the wheel when the driver of the car had stepped away. One thing I noticed and thought was quite cool on the way out was this. 12,000 people were making a mass exodus from a venue and it was dead quiet. I had just seen Elton John a few weeks prior and that was not the case afterwards there. I realize that these were two entirely different types of events but still, it’s something that I noticed. I had a really cool road trip with really cool people and the destination was great. Truly a day that I won’t ever forget. Categories: wisdom | Tags: ar, dalai, fayetteville, lama | Permalink.